Vikings left off with Ivar the Boneless vowing vengeance on his betrayers — and placing a direct target on Lagertha’s back. Last seen in an unstable state and shedding her fierce warrior appearance, Lagertha (played by Katheryn Winnick) nonetheless is hopeful she will regain her spot as Kattegat’s rightful leader. Season 5 resumes (Wednesday, Nov. 28 at 9/8c) with the arrival of Duke Rollo (Clive Standen), a former viking, who causes further upheaval in a Kattegat. As Lagertha and Bjorn flee Ivar’s murderous forces with Bishop Heahmund (Jonathan Rhys Meyers), Ivar’s tyrannical reign over Scandinavia ushers in a new Dark Age, the likes of which have never been seen. 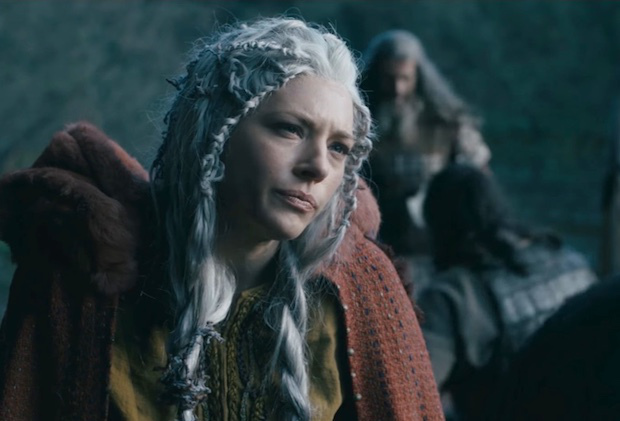 In the scene above, Lagertha wonders aloud if Bishop Heahmund can still be trusted to not feed her people to the wolves, or if she need worry about betrayal, since “everything is different” for him, now home in England. What is his response? Press play to find out.